Over the rough winter I found two big mystery cocoons in Prospect Park on separate days, under different oak trees. Naturally, I took them home and set them up in my kitchen in a take-out food container. Whatsthatbug.com told me they were something in the giant silk moth family (Saturniidae), either a Polyphemus Moth (Antheraea polyphemus) or a Luna Moth, either of which would be pretty spectacular and huge. Months went by. I found out that they would hatch–if they were viable–probably in May, maybe in June. I kept looking at them and they kept doing nothing. 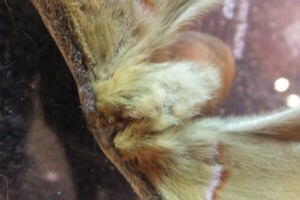 I learned from various post by butterfly ranchers on Gardenweb that you should superglue them to a stick so they hang and eventually “eclose” or hatch properly. Nothing continued to happen. I was about to give up. 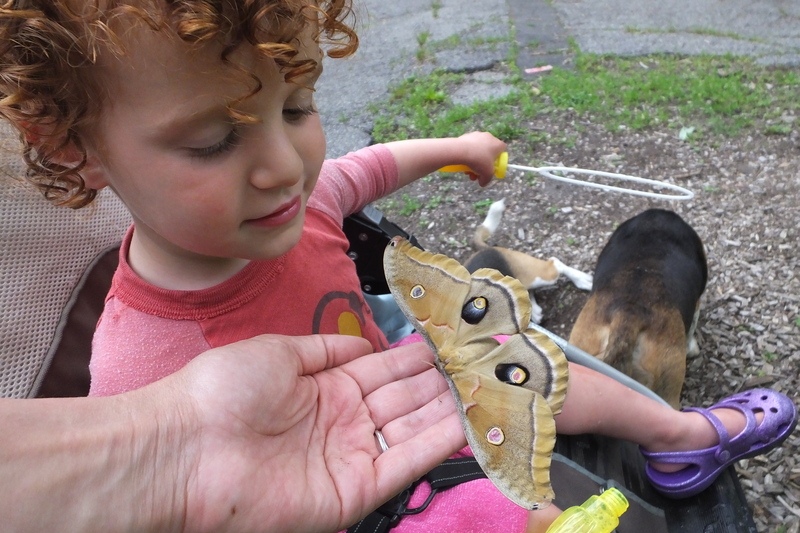 Then the first week of June, with the kitchen door open for the warm air, my husband told me there was a big butterfly on the floor that he had decided to let me deal with. I checked the cocoons and at first they seemed intact. 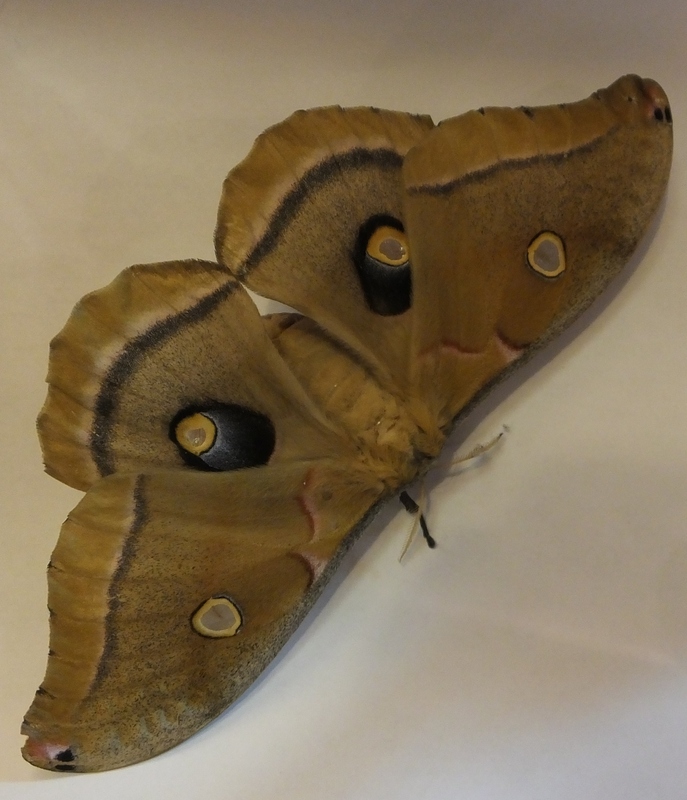 I thought for a moment that the universe was determined to give me a polyphemus moth. Then I checked again and one of the cocoons had a big hole. I had expected to see the whole thing happen, but now it was already done. Moths at this stage don’t have moth parts, so feeding was not an issue. Since neither of us had seen it when we were in the room a couple hours earlier and the cocoon was on a shelf over a our kitchen table, I figured it had just hatched. So I let it dry out and get ready. Then in the afternoon my daughter and I tromped it up to what we call Butterfly Hill–really look-out hill–which always seems to have the most butterflies and moths in Prospect Park. Also, unlike where it fell, there are few people. 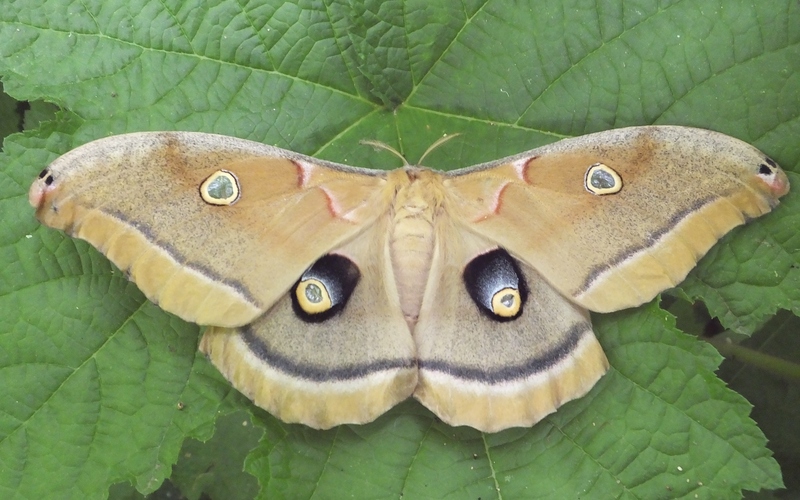 We set the moth up between leaves of a shrub so birds couldn’t see it. And we hope it found a mate and laid eggs quickly and often. Because that’s all they do at this last stage of their lives.